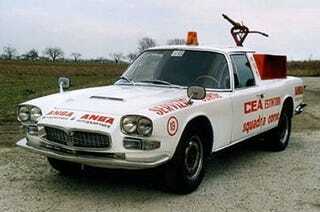 Vintage Maserati Quattroporte-amino Fire Truck Is Here To Save Us! One of five cars built by the Construzione Estintori Anticendio of Bologna, this 1967 Maserati Quattroporte was camino-ized for firetruck duty. Known in their day as the "fastest fire tenders in the world," they were powered by the original 4.2-liter four-cam V8 engine that churned out a healthy 260 HP. Serving duty at Italian race tracks, they were, in typically Italian fashion, an overly stylish solution for the job. So where are they now?